Or you should choose a Phosphor Bronze Acoustic Guitar String which offers a bright, rich and warmer tone than the 80/20 strings. After testing 13 different Acoustic Guitar Strings (see also our Guitar String Reviews) we have found our TOP 5 Acoustic Guitar Strings below. D’Addario Phosphor Bronze Acoustic Guitar Strings are one of the best acoustic guitar strings we ever played on our guitars. They are are engineered to serve as the critical link between you and your guitar. The EJ Acoustic Guitar Strings are precision wound with corrosion resistant Phosphor Bronze onto a carefully drawn, hexagonally shaped, high carbon steel core. The result is in our opinion a long lasting, bright acoustic tone with a brilliant intonation. 80/20 Bronze, commonly referred to as brass, is the original acoustic string alloy selected by John D’Addario Sr. and John D’Angelico in the 1930s. 80/20 Bronze strings are popular for recording due to their crisp, deep and projecting tone and appeal to many traditionalists and vintage enthusiasts for their historical significance. Three components of a D’Addario guitar string work together to create your desired tone: Hex-core, outer wrap wire, and ball-end. It all starts with the core. D’Addario pioneered the use of the Hex Core, and as the name suggests, it is a six-sided high carbon steel core-wire. Each side “bites” into the wire used for the outer winding, creating a tight and consistent bond that keeps the string in tune from end to end. The final component is a D’Addario exclusive: color-coded ball-ends that secure the string in place at the guitar’s bridge, allowing for easy string identification and a major reduction in wasteful packaging. With their round wound wire strings they deliver the traditional textured feel which most players love. 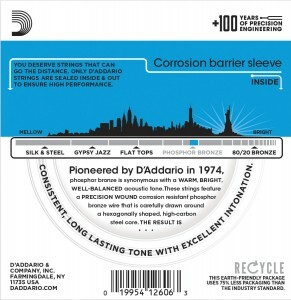 D’Addario EJ16 Acoustic Guitar Strings are made of 92% copper and 8% phosphorous since 1947 in the U.S.A. They are environmentally friendly, corrosion resistant packaging for strings that are always fresh and healthy. 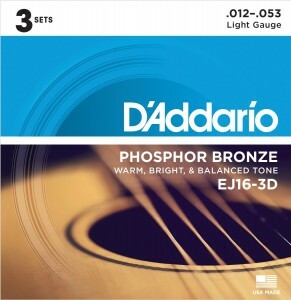 D’Addario’s Phoshor Bronze Acoustic Guitar Strings offer in our opinion the ideal balance of volume, projection and comfortable playability. 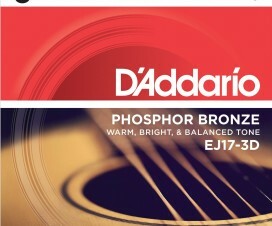 Phosphor Bronze has normally a warm, bright, and well balanced acoustic tone. D’addario’s Acoustic Guitar Strings have an extra-bright tone mixed with deep and projecting bottom end. We think they sound very bright, rich and have a real nice warm acoustic. The normal List Price is $ 35.49, but now they only cost $13.49 for a 3-pack which has the best price-value ratio. D’Addario acoustic strings are the choice of countless professionals around the world including Dave Matthews, Sheryl Crow, Keith Urban, Blake Shelton, Ryan Adams, and many more! 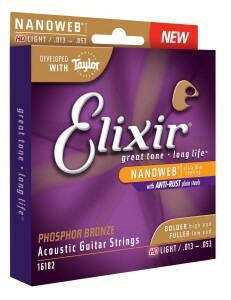 Elixir claims the Acoustic Guitar Strings Phosphor Bronze with Nanoweb Coating to be #1 Acoustic Guitar Strings. In our review they are close to d’addario’s guitar strings and in the end it is just a matter of “good feeling” and your personal opinion in the usability and tone. 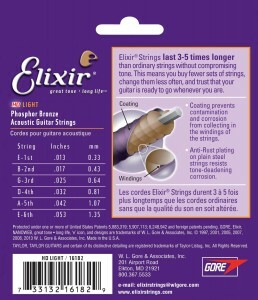 The HD Light Strings offer a comfortable balanced hand feel together with the extended tone life that players have come to expect from Elixir Strings. With less hassle and expense of frequent string changes, you enjoy more time making music. Elixir players report that they have a smooth feeling that is easy on your fingers and enhances playability. The #1 acoustic Elixir guitar strings provide consistent performance, smooth feel and reduce finger squeak. 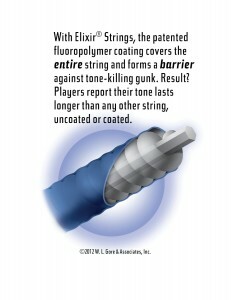 Elixir claims to be the only coated string brand to protect the entire string with an ultra-thin coating, keeping gunk out of the gaps between the windings. Moreover the Anti-Rust Plated Plain Steel Strings also resists tone-deadening corrosion, ensuring longer life for the entire set. We think you don’t do anything wrong with these Elixir Acoustic Guitar Strings and they are in the same high-quality like D’addario’s. If you saw the video above (Comparision between D’addario & Elixir Guitar Strings) you can hear a difference in the guitar string acoustic. 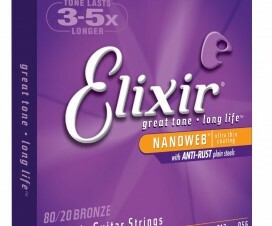 In our opinion Elixir Guitar Strings deliver bolder high end and fuller low end with a balanced voice across all the strings which making them ideal for narrow bodied guitars. Moreover we heard an extended tone life in our tests which is also reported from other players who say their tone lasts longer when playing with Elixir Guitar Strings. 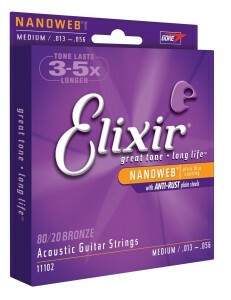 As our #2 Elixir Acoustic Guitar Strings we also tested the 80/20 Bronze version of Elixir’s #1 Acoustic Guitar Strings. The Quality is as great as the Phosphor Version. The Nanoweb Coating helps the Acoustic Guitar String to extend its lifespan and to have a great feeling when you play this kind of guitar string. 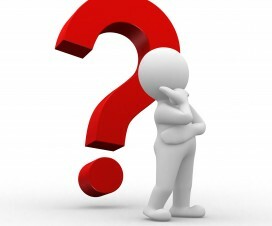 So what is the difference between the Phosphor and the 80/20 version? Of Course the sound! The 80/20 Elixir Acoustic Guitar Strings deliver a bright, lively tone. If you are an advanced guitar player you will hear the difference. This is in our opinion again an individual choose which sound you like more to decide between these both guitar strings. As the Phosphor version we heard an extended tone life which was great. On our #4 we have another guitar string brand. We think the Martin Phosphor Bronze Acoustic Guitar Strings deserve to be place 4 due to their price and their stability. 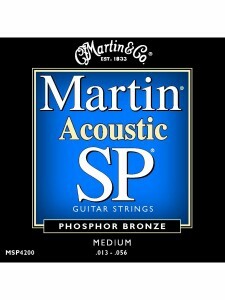 Martin Phosphor Bronze Acoustic Guitar Strings use a winding alloy that is ideally suited for making strings that deliver deep, rich basses and clear, bright trebles. In our test we saw a good quality, but we think the quality is less good than from brands like Elixir or D’Addario. Some guitar players out there are strongly believing in Martin Acoustic Guitar Strings and we think they can be right, but we are not. Here is were Martin Guitar String benefit, they have a great deep, rich basses and clear, bright trebles sound. Their acoustic is different to d’addario’s and elixir strings and you should try them if you have not before. Our #5 Ranking is the Medium version of our #1 Place. D’addario brings with the EJ17 another great Acoustic Guitar String. 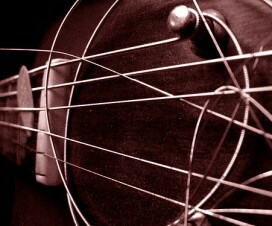 What is your favourite Acoustic Guitar String for your Guitar? Guitar String Order – What you have to consider ! Great Review Thanks. I prefer the D’addario E16 .. great sound! Good reviews! Just curious if you have tried the Ernie Ball Aluminum strings.? Yes. I like them for recording and they have a very sharp tone. I tried Martin SP coated strings…..pulled them off after two uninspiring weeks. Elixirs sounds very good. at the moment Im using Ernie Ball Aluminum Bronze on my Alvarez Masterworks, Sitka Spruce and solid Rosewood guitar, this is my third set and I really love the tone, play ability, and they last! they are a little bright at first, but settle in producing a nice balanced sound, I used elixers before and will probably try them again at some point. 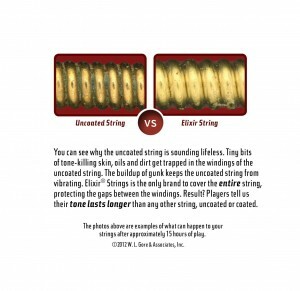 Guitar String Reviews Copyright © 2019.